Depending on where you shop, wall art — even reproductions — can be expensive. Making your own art is cost effective, and you may choose your topic and color scheme. This project is perfect for crafters with no drawing skills. A handy butterfly punch does the work. The beauty of creating personal art is how customizable the artwork can be. With so many scrapbook-paper patterns and colors from which to choose, anyone can find something that strikes his or her fancy. 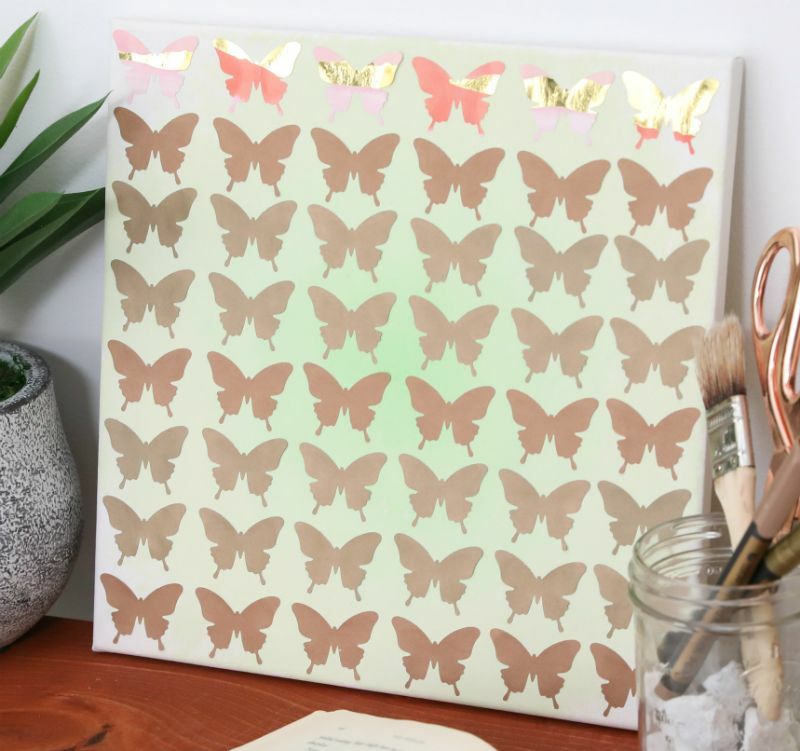 Glue white or crimson butterflies onto a canvas painted black and gray for a dramatic look, or try fun patterned butterflies on a rainbow canvas for a child's room. 1. Punch out 18 brown butterflies, 24 light-brown butterflies and six contrasting or complementing butterflies. Set them aside. 2. Fill four paint wells halfway with green paint. Add a small amount of white paint to one well with green paint. In the next three wells, add an increasing amount of white paint so there is a very slight difference between the green shades. Mix the paint in each well. 3. Cut the dry sponge into four equal strips. 4. Dip one strip into the darkest green paint. Dab the paint onto the center of the canvas until you have a 3-inch circle. The edges do not need to be neat. 5. Dip a second sponge strip into the next darkest green paint. Dab the paint around the perimeter of the painted circle, going out 1 inch. 6. Dip a third sponge strip into the next darkest green paint. Dab the paint around the perimeter of the second painted circle, going out 1 inch. 7. 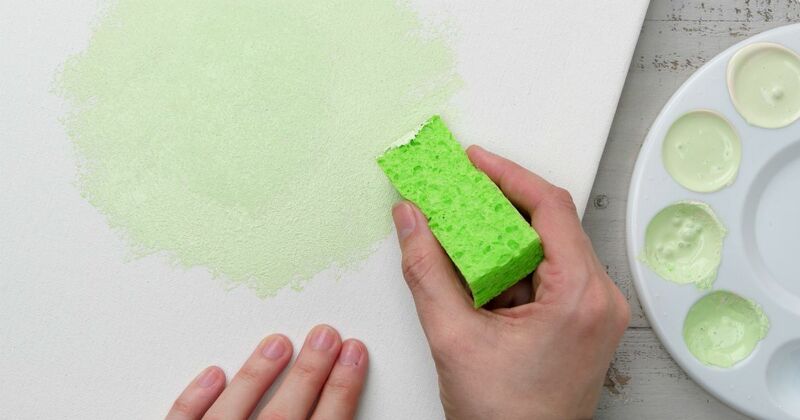 Dip the fourth sponge strip into the lightest green paint. Cover the remaining unpainted canvas with this shade. Let the paint dry. 8. Apply glue to the back of a brown butterfly. Press it onto the canvas 1/8 inch in and up from the bottom left corner. Glue a line of five brown butterflies (L1) to the right of the first butterfly, equidistant from one another. 9. Glue a line of six light-brown butterflies (L2) horizontally above L1. Glue another line of six light-brown butterflies (L3) horizontally above L2. 10. Glue a line of six brown butterflies (L4) horizontally above L3. 11. Glue a line of six light-brown butterflies (L5) horizontally above L4. Glue another line of six light-brown butterflies (L6) horizontally above L5. 12. Glue a line of six brown butterflies (L7) horizontally above L6. 13. Glue a line of six contrasting or complementing butterflies horizontally above L7. Let the glue dry.